In this column an early Wayne Country Club and a somewhat later Cricket Club have already been described, The former was the Merrivale Club, situated in North Wayne near the railroad tracks. It had a baseball diamond, tennis courts, billiards and bowling. This later became the Radnor Cricket Club, during the days when the center of English cricket in the United States was Philadelphia. After several years of activity, the original Cricket Club house burned down, and a second club was started on the Francis Fenimore land at St. Davids. For several years matches were played here with other cricket teams around Philadelphia. Tom Credican was the professional for the local team, which was so good that one season they won all matches except that against the Merion Cricket Club. Uniforms consisted of white flannel trousers and shirts with light blue blazer coats and small blue caps to match. On the later were the yellow initials, “St. D.” The club house was a one story frame building painted yellow, with a main room and lockers. A pleasant tree-shaded porch overlooked the nearby ponds. Match days at St. Davids were well attended by the ladies, all in their best attire, adding greatly to the gala effect of the typically English country sport. On one such occasion two horseback riders stopped on a distant knoll to watch the match. The batsman made a tremendous hit out of bounds and the ball landed on the rump of one of the horses! Both riders were thrown to the ground and when last seen by the cricket spectators they were chasing their runaway mounts, waving their riding crops as they ran. The fact that they were attired in the wide breeches, bowler hats and russet boots of the horseback riders of that day, only added to the mirth of the onlookers. For a time the cricket game was abandoned! After a time, local interest in cricket waned and activities ceased after the club house burned to the ground during a fire which started in the long grass after a dry spell. Then came the organization of the St. Davids Golf Club, one of the oldest institutions of its kind in the United States. At this point it is interesting to quote George W. Schultz, from whom my information has been obtained. “One Sunday in the spring of 1896 A. J. D. (Tony) Peterson came to my house carrying a small white ball and a club with a bent iron on its end and, chuckling, he began tapping the ball on the lawn. He said he had been to Devon the day before by invitation of a friend who introduced him to a Scotch game called “golf,” started by summer residents of Devon Inn. “It seems that Edmund McCullough, president of the Westmoreland Coal Company; Edward Ilsley and others had laid out a nine-hole course on the spacious land around the hotel. In so far as I know, this was the beginning of golf in Pennsylvania. Tony Peterson arranged for me to be allowed to play on the course the following Saturday with some clubs lent to him. The former cricketers now became golfers and by their own enthusiasm attracted many others to this original group. The moving spirits of the project laid out the nine hole course “which had natural hazards rather than artificial bunkers.” It could certainly have been called a “sporting” course! Since they could afford no laborers, the original small group armed themselves with picks, rakes, and shovels for their job and they built their own tees and mowed their own grass! At first the players were all men, as at that time few women were given to outdoor sports. These men were sticklers for good form, observing the courtesies and rules of the game according to St. Andrews tradition. At that time a golf ball was made of solid Gutta percha with either checker or pebbled moulding. When hit, a distinct “click” was heard, quite different from the “mushy” sound of the later Haskell rubber-cored ball. It was seldom that the longest drive exceeded 150 yards. All the players were self-taught, many learning how to play by reading booklets of instruction. Dr. G. L. S. Jameson was elected the first president of the original St. Davids Golf Club. With spring in the air and summer not far off, the thoughts of many a Wayne resident, young and old, turn to those warm days when swimming in nearby pools will furnish much welcome recreation. They will gladly go their ways to Martin’s Dam or Colonial Village Swimming Pool or the Mill Dam, little realizing that once upon a time Wayne swimmers of another generation did not have so far to go. For in the early nineties they did their swimming at Kelly’s Dam, a body of water down in the hollow near the railroad tracks in the general vicinity of what is now Willow avenue! As a matter of fact, Wayne was one of the first localities in this section to have an outdoor swimming pool. In the beginning it was just a good old “swimmin’ hole.” Then an interested group rented the rights to Kelly’s Dam and began to make some improvements. A dressing room was built on piles and there were diving boards, a slide and other equipment. This was enclosed by a high wooden fence to make it private, with a boardwalk along one side of this fence. the diving board was at the deep end of the pool while the shallow end had a wooden bottom. The creek along Willow avenue did not run directly into the pool as there was some sort of filtering system to keep the water clean. In winter when the pool froze over there was skating by lantern light with a stove for heat in the small club house. Yearly dues entitled members to both swimming and skating privileges. Among those early members were the Wendells, the Heilners, the Spiers, the Conkles, the Hallowells, the Fulweilers, the Reginald Harts, the Canizares, Frederick Jones, Louis Erben, Charlie Maguire and the large John P. Wood family and many others, whose names are not now available. Activities at Kelly’s Dam were under the supervision of Kistler, their swimming coach, who later became an instructor at the University of Pennsylvania. At the opening day races, Osgood Sayen upheld the prestige of Wayne by winning the 60-yard novice race against a large field. At that time the Australian crawl stroke was a new sprint idea. From time to time quite large swimming meets, considering the size of Wayne, were held here. In the light of present-da methods of teaching swimming those of that early period are interesting by way of contrast. A telegraph pole was sunk in the ground at each end of the pool, with a heavy wire cable stretched across the water. To this was added a rope on a pulley with a belt attached at the water line. The pupil was strapped into the belt and thus taught the art of swimming without danger of going down! As time went on the young people began to go to Fenimore’s pond in north St. Davids for their swimming and skating. “Billy Pump,” who took his name from the fact that he ran the pumping station for the Pennsylvania Railroad, was in charge there. He was part Indian and considered quite a character. Be it said to his great credit, that while he could not swim himself, he patrolled the pond in his row boat so conscientiously that he never had a drowning! Many christenings took place both at Kelly’s Dam and at Fenimore’s Pond. Some still remember the time when the crowd watching one of these christenings at the former place was so great that the boardwalk gave way and the spectators themselves were tumbled into the water! Many remember, too, the white-robed figures and the loud screams when baptisms of one of Wayne’s colored churches took place at Fenimore’s Pond. In the late nineties the bicycle craze struck Wayne with the result that a bicycle club was formed with headquarters on the pike north of the post office. There Karl, the German steward, provided excellent meals for members and their guests. One particularly noteworthy one was a terrapin supper, Maryland style, prepared by Bob Martin, assisted by Dr. Kueri, of Philadelphia, and by Paul D. Chaillu, the African explorer. Their combined efforts produced a banquet worthy of the name! And after an evening of good eating and much merriment, the guests rode home on their bicycles! Among the leading spirits of the club in addition to Bob Martin, were Francis Fenimore, Julius Bailey, “Goostav” Bergner, “Der Goos” Gallagher, Tony Peterson and “Demon” Schultz, and this is to mention but a few! 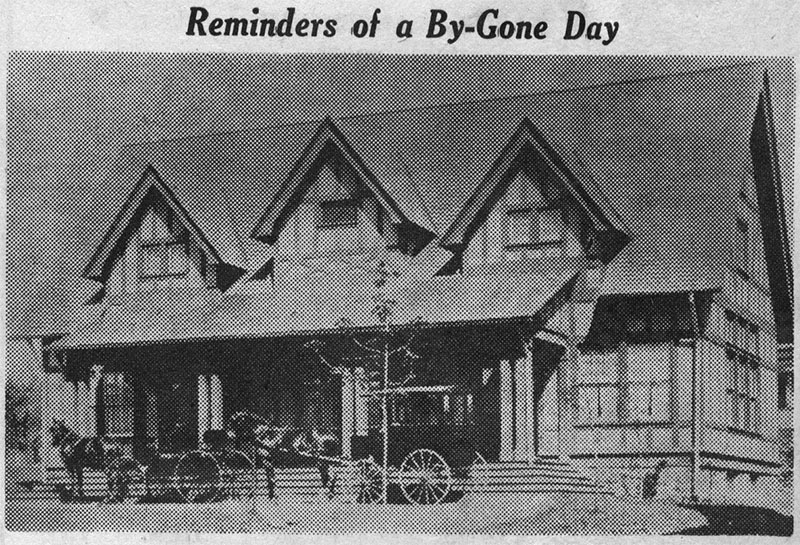 This is a picture of the original Saturday Club house, built in 1898, as described in “Your Town and My Town,” in a recent issue of The Suburban. The wagonette at the left has been identified as that of the late John W. Yeatts, of St. Davids. Identification of the other vehicle would be interesting. Information would be appreciated by mrs. Patterson, Wayne 4569, for use in her column. Since writing in last week’s column of fire protection in Wayne in the early days of our community, further information on the subject has come to me from George W. Schultz, of Reading, Pa., though his daughter, Mrs. Robert W. A. Wood. In telling of the formation of Protective Associations “on both sides of the village,” Mr. Schultz describes organized fire fighting as one of their chief objects. As Wayne’s population began to increase in the late eighties, these Associations became necessary in the absence of any municipal government. They were supported by dues paid by property owners and had several noteworthy purposes in addition to fire protection. These included the improvement and beautification of properties, the maintenance of street lights and of sidewalks and the guarding of public health and safety. Among their manifold duties were those to provide for the collection of ashes and of garbage and to remove snow from the pavements in the winter. The North Wayne Protective Association, formed in 1885 by seven residents of North Wayne and the Wayne Public Safety Association organized in 1890, have both functioned continuously since their inception, each, at this time, with a large membership still interested in all civic problems. Mr. Schultz describes in amusing fashion two of his own youthful experiences as a volunteer fireman. “When my parents settled on Walnut avenue, North Wayne,” he writes, “a committee called and announced that in event of emergency, all young men were expected to turn out and act as volunteer firemen. “Sure enough, it was not long before my brothers and I were awakened one night by ‘Fritz’ Hallowell’s ringing a dinner bell. Tumbling out in the dark, we followed some running forms to John P. Wood’s stable where we were ordered to ‘man the pumper!’ We had never seen the machine nor had any drills. It was a 500 gallon hogshead of water on two wheels and a hand pump attached. Some grabbed the ropes tied to the tongue of the ‘engine’ and others pushed. It ran all right down hill, but the fire being located by glare in the sky as up on a steep hill on Chamounix road, St. Davids, it was a strenuous effort to get the apparatus to the scene, egged on by raucous yells of the fire chief. The house appeared to be vacant in the late fall and the blaze was, of course, stimulated by the amateur fire fighters breaking the rear windows with axes. A brave fireman climbed the porch and the helpers worked hard on the lever. The only result was a garden hose –am squirted into a second story broken window. The house burned to the ground! Mr. Schultz is an authority, too, on the sports and recreations of early Wayne. He tells of an organization, first called “The Merivale Club” and later “The Radnor Cricket Club.” It was housed in a frame building near the railroad in North Wayne, which later burned down. In its early days it had a baseball diamond and a board backstop, surmounted by a pavilion reached by stairs from the rear. The Club had two tennis courts, billiards and bowling. Among the young men who were members were Robert Hare Powel, Henry Baring Powel, Jack Claghorn, Morris Wetherill, Frank Howley and George and William Schultz. Some of this group later started a golf club on the Francis Fenimore land in St. Davids. After the Cricket Club came the Swimming Club, located at the famous Kelly’s Dam in North Wayne. Then there was the Bicycle Club, with its Club House located on the pike north of the post office and later still there was the organization which was to develop into the St. Davids Golf Club. From time to time all of these sports groups of Wayne’s early days will be described in this column. The story of Louella House as given in last week’s Suburban was founded upon information gathered from various sources by Miss Josephine W. Scott for a paper she read several years ago for a group from her Church Missionary Society. In this meeting the members of the society were assembled in the same large room in Louella Apartments which was described in last week’s article as the formal parlor of Louella House. Fortunately the notes for this talk were preserved and from them has been drawn the description we give you for this week of the Wayne of an earlier day. Back in 1868-70 when Louella House was built, most of what is now Wayne was rolling farm land, where cattle grazed as they stood in the shade of chestnut, hickory and oak trees. On the site of what was known until very recently as the William Wood property on the north side of West Lancaster avenue, the Cleaver Farm was located. The Cleaver house, built in 1775, was sold by that family to J. Henry Askin, who in turn sold it to W. D. Hughes. Later it became the property of William Wood. The first railroad station took its name from the Cleaver Farm. This station was called “Cleaver’s Gate” or “Cleaver’s Landing,” since trains stopped there to take on milk. The Pennsylvania Railroad company, originally known as the Lancaster and Columbia Railroad Company, had built double tracks along the Main Line in the early 1860’s. Later, “Cleaver’s Landing” was known as Louella and then as Wayne. The first station was a large square wooden pillar laid on its side where passengers sat while they waited to flag the train. An old wagon bed which too the place of this pillar was burned one Fourth of July. Then a small box-like station was built with a house attached in which the ticket agent lived. This house is still standing on its original site, considerably to the south of the present tracks, however, as the road bed was moved a one time. It is now used by the Wayne Hotel as sleeping quarters for employees. Even a casual glance easily identifies it as a one-time railroad station! A path past the old Presbyterian Church led to the station in its early days. North of the railroad there was but one farm. On it was a lovely little lake and many beautiful trees. Later this property became the home of Dr. George Miles Wells. The Wells home still stands on its original site on Walnut avenue, though it has now become a small apartment house. The spacious ==== lots on which many homes have been constructed, some facing on Poplar avenue, some on North Wayne avenue and some on Walnut avenue. The two main highways of Cleaver’s Landing in the 1860’s were Conestoga road and the Philadelphia and Lancaster turnpike. At that time the former had already been in existence for more than a hundred years, having originally been an Indian trail from the Delaware River to the Susquehanna River. The latter was the first turnpike built in the United States, dating back to 1792-93. With its toll gate it went from Philadelphia to Lancaster and points West. What is now West Wayne avenue was the Wayne road, built in 1808. It was but 33 feet wide. Where the Saturday Club now stands there was a little bridge coming from the Cleaver Farm. Church road, going from Five Points to Old St. David’s Church, was built in 1863 and like Wayne road, was 33 feet wide. So much for roads. As to the pavements, they were originally of “the kind of mud where overshoes lost in the Fall, reappeared only when the frost came out of the ground in the Spring!” Later there were boardwalks, the loose boards of which were apt to spring up at unexpected intervals and tip the unwary. Then followed cinder paths, later stone slabs and still later, concrete walks. On the corner of Conestoga and Wayne avenues there stood at the time the old Radnor Baptist Church, organized in 1841, through the untiring efforts of Mrs. Emily Worthington Siter. The original building was destroyed about 1889. Back of the church building was one of the first schools in the community. On Conestoga road, near what is now Wayne-St. Davids station of the Philadelphia and Western Railway, was the famous old Conestoga Potteries. Fire protection, even in the early days of Wayne, was considered very essential. Each householder was provided with a fire horn three feet long, to be blown when the occasion demanded. The horn call is described as something like a sick cow! A fine of five dollars was imposed for any unwarranted blowing of a horn. Early records also state that a bucket of water was behind the front door of each home, also that householders took nightly turns in patrolling the neighborhood. The present Radnor volunteer Fire Company, chartered in 1906, represents the consolidation of several small fire companies which served various parts of the community earlier.